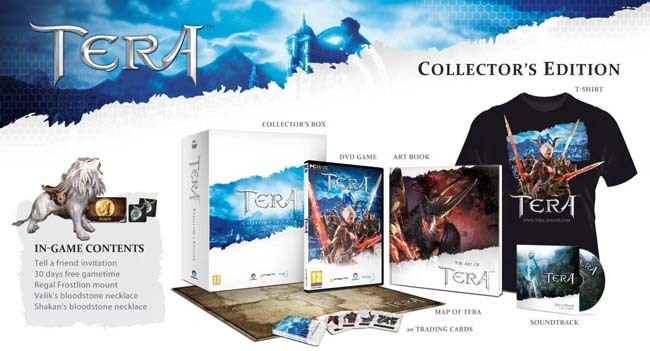 Released in Europe at the start of the month, TERA, the MMORPG game, has been subject to critical acclaim. We've teamed up with Frogster Gaming and are giving away seven copies in our latest competition. Five winners will receive the standard edition, which is nothing to be sniffed at, but two lucky winners will have the Collector's Edition winging their way to them in the near future. Feast your eyes on this! Think you know the answer? Then enter your name and email address in the form above and you'll be entered into our prize draw. We'll be pulling the names of seven lucky winners out of a hat shortly after the competition closes, so good luck! Sweet, been interested in Tera with the combat being more free flow like an action RPG, entered and thanks always to the guys that set these awesome competitions up. I'd like to give this ago at some point. Looks good. I want to know if it is a grind fest or actually fun.